We're settling in to life in the Bahamas. There are several different types of cruisers here. 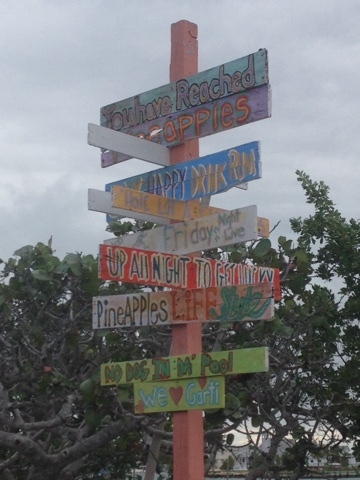 Some nestle into protected Green Turtle or Hopetown and live on their floating condo for the season. Some are hopping around the Abacos for the season and will return to Florida at the end of the season. Some are island hopping from bar to bar (tempting but expensive). Others are headed southbound to The Exumas and beyond. The cruising community is also very small, especially this early in the season. We keep bumping into the same boats, or friends of theirs, as we move around. You never know who will show up and anchor next to you! We are also still slaves to the weather. I'll explain more as we go. 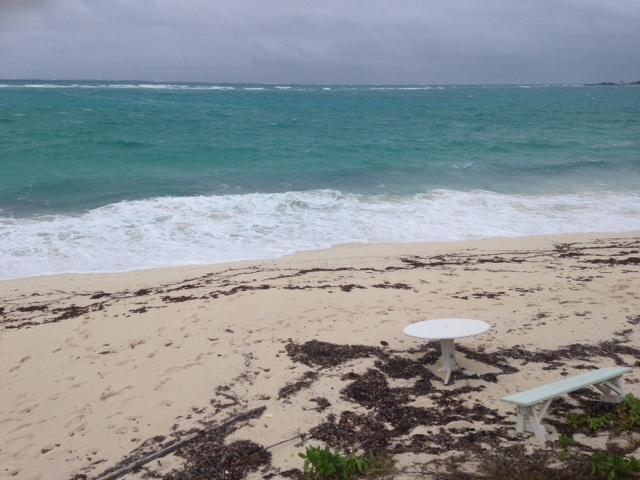 We moved over to Green Turtle to sit out the high winds forecast for the weekend. It was overcast during most of our stay, so I didn't get many good pics of this quaint island. 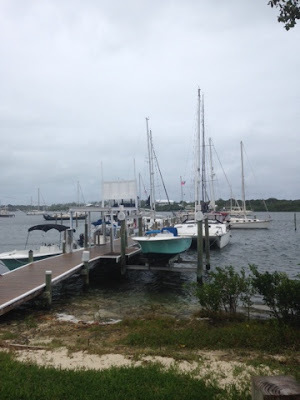 We stayed at Donnie's who offered us dock space for the same as a mooring. We tucked into a shallow spot on the dock leaving room on the mooring for a deeper draft monohull. We also had "Bahamian" shore power (15 v hooked to battery charger) so we caught up on the blog (other cruisers blogs), movies & reading. Donnie's isn't a fancy marina, but he has a new bathroom with a shower. It's on the honor system--just drop your $4 in the jar. It's also "pay whenever"--we caught up with Donnie on Tuesday and he said we owed him $22/day. "How long have you been here?" We hear from sv Willful, anchored out at Manjack who invites us to join them at Great Guana for drinks. The winds have let up and the swells out on the ocean have decreased so, we're springing off at 7:00 am so we can depart Black Sound channel at high tide. 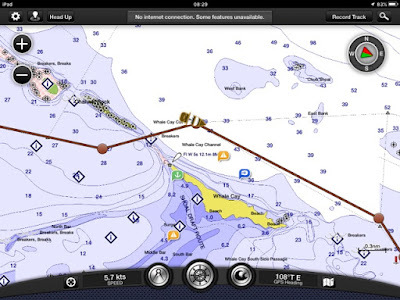 It's 15 miles and a 3 hour motor out and around Whale Cay, a tricky passage unless the conditions are right. We had ideal conditions with less than 10 kts but still 3-4 ft swells. Another first--sand is better holding than grass. So after referring to the guide book and chart plotter we feel our way into the anchorage, with the Captain on the bow looking for a light spot in the water. A monohull waves us on--"there's plenty of water up there for you!" We drop anchor in 6 ft of water so clear, we can see the anchor. I feel a bead of sweat for the first time as the sun comes out, and scramble to change into a bathing suit and grab my new mask. I'm just learning, but soon add the snorkel and follow the Captain around the boat as he scrapes. I check the anchor then head back for the fins. Pretty soon I'm following the Capt around the anchorage looking at fish, starfish and potatoes--yes trash. Great Guana Cay--Let's learn to snorkel!!! 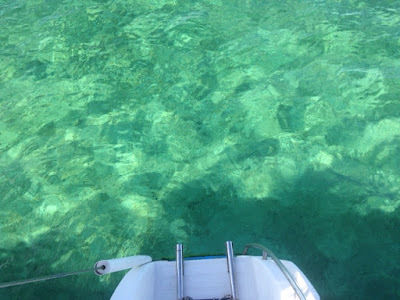 We rinse off, change and dinghy into Grabbers for lunch (outboard quits running just short of the beach), just into time to see Willful motor in and drop anchor. We go for a walk, then dinghy out to say hello (outboard dies again). We get a tour of the steel-hulled schooner then head back in for a walk to Nippers and a view of the Atlantic ocean (no snorkeling out there today!). The mosquitos are out in force and bold so we retreat back to a new sports bar called Fish Tales for air conditioning and rum punches. Of course we realized we didn't have our dinghy lights or anchor light on, so we found our way back by the light of the LARGE fire in an adjacent boat's grill and my iPhone. Stats: Total time 3:03, avg speed 5 kts, total time 15.2 nm, motored. Marsh Harbour: The mosquitos are still bad in the morning, so we keep the boat closed up until 9:30 when I head out to explore in the kayak, while The Captain plays with the dinghy's fuel line. By lunch, we decide to head to Marsh Harbor. The Captain needs dinghy parts and I want wifi! We'll also be tucking in to the protected anchorage for some 20-30 kt forecast winds for the weekend. The Captain was at the helm the whole way around the Whale, so the First Mate is at the helm for the trip over to Marsh. As soon as we drop anchor, we're quickly joined by Mike & Vickie from the other PDQ 36 in the anchorage, Double Exposure. We're up friday morning for errands (because many businesses are closed on the weekends). BTC for a sim card, hardware/marine store, propane, and fuel. sv Kelly nicole arrives--our friends from Brunswick and Vero. Pretty soon we're off to a pub to catch up. Snappa's with sv Kelly Nicole. 2 cruising budgets blown to bits! Saturday was a loss. We slept in with hangovers and we had a lazy day. We did manage to dinghy into Harbor View Marina for 3 jerry cans water (0.20/gal) & 2 jerry cans of fuel. By Sunday the 20+ kt forecast winds arrived. It was gusty all night except out of the ESE instead of the NE. 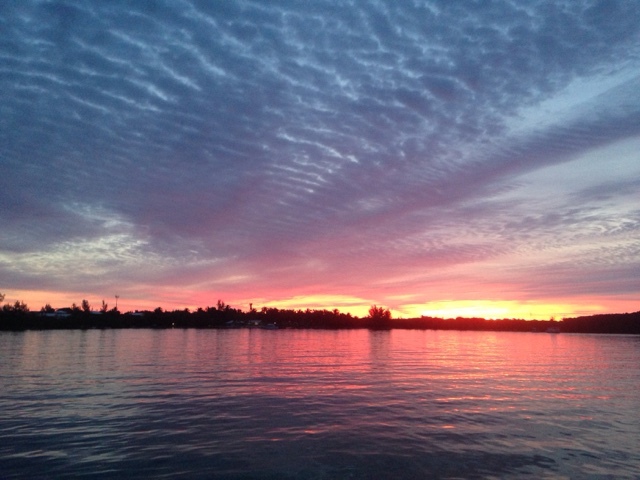 It looked like another day on the boat until a lull @ 9:30. I scrambled to pack up laundry and shower supplies for a long run into the waves to Harbor View. We arrived an hour before they opened so we had to cool our heels. $3/shower. $9 to wash & dry. As usual, it ran into lunch time, so Husband went for snacks at the nearest market (doritos, cheetos, @ potato chips with diet coke). We retired back to the boat for a Harry Potter movie and a dinner of Bahamian peas and rice. After experiencing the clear water and snorkeling, we've decided we're ready to move further south. 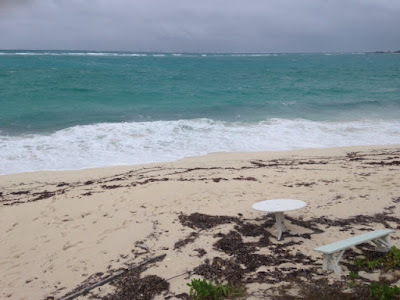 There's a weather window Wednesday (less than 15 kts of winds, less than 3 ft waves and favorable winds for sailing) to cross over to Eluethera on the way to the Exumas. Make sure to stop at Hatchet Bay. Thanks, Deb. It was on the list for tucking in this weekend! 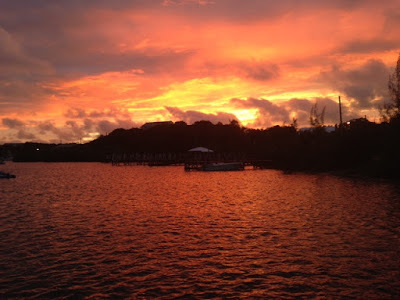 You probably have more info than you need, but our blog covers several cruises to/from the Exumas. 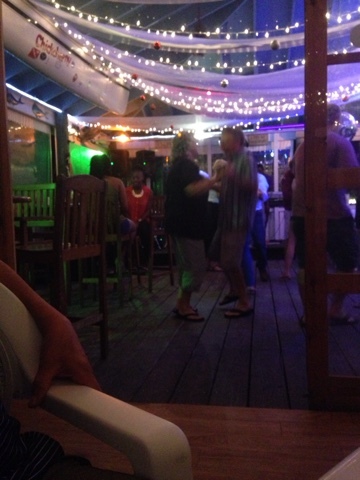 So glad to see other enjoying the Bahamas, too.